Decorating for autumn is especially satisfying when you add a few new elements to your palette. 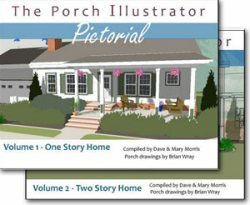 The porch you see here is really a fresh take on autumn decorating and we know you will enjoy the tour. Welcome to Ann's Ohio front porch. 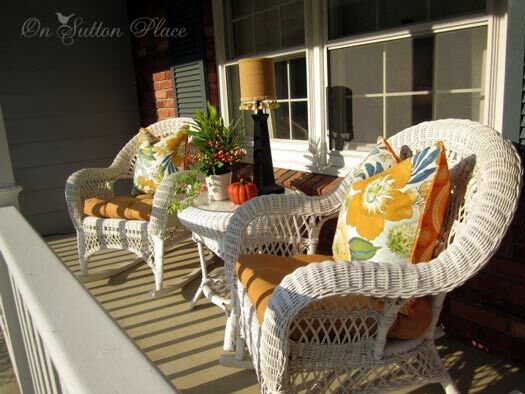 Ann is the creator of the beautiful blog, On Sutton Place, and she really has her porch jazzed for the autumn season. 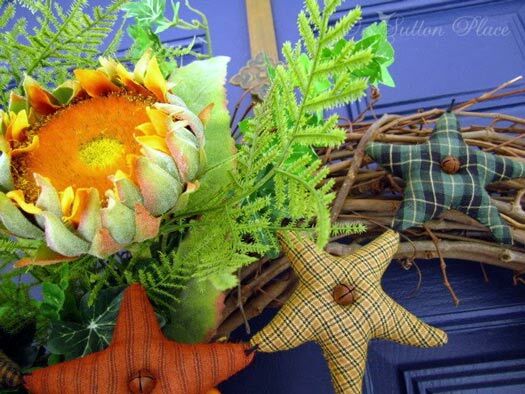 She has an amazing gift for color and putting things together to create fall front porch decorating ideas. 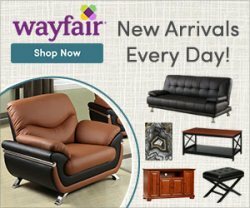 So come take a look at her fall decorating ideas. 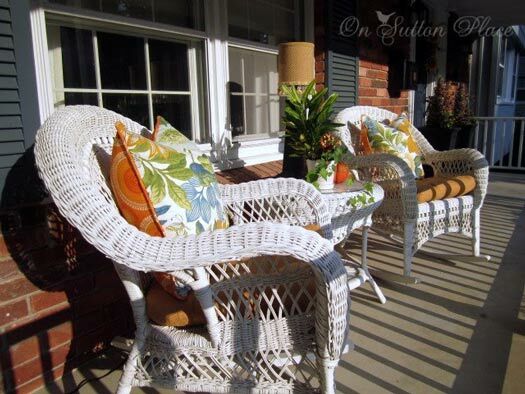 This is the sitting area at the end of Ann's Ohio front porch. Ann found the gold cushions at Pier 1. They are the perfect autumn color and they make her white wicker rockers look so comfortable and inviting, too. We like the side table in between the chairs. Ann has it all decorated for autumn with the sweet little pumpkin, a cute lamp, and some greenery with bittersweet. I am wondering if Ann covered that lamp shade. 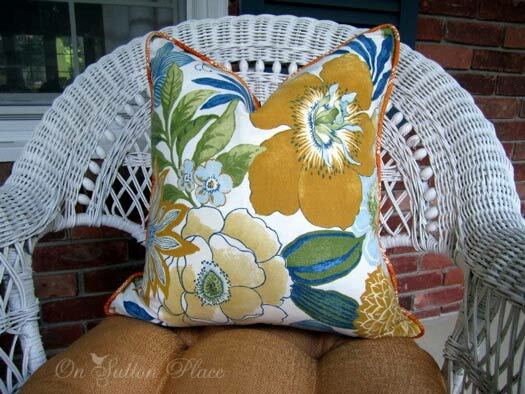 It looks like burlap fabric trimmed with fringe; perfect for that spot. 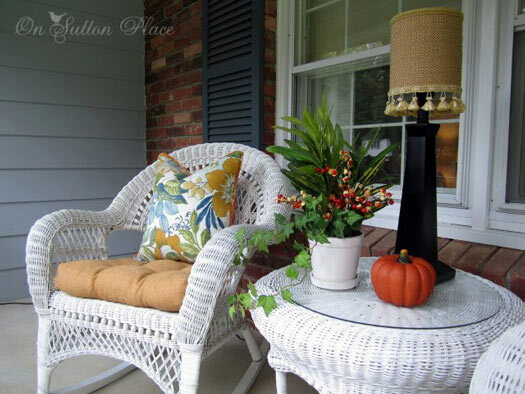 The black lamp base echoes the accessories on her porch. A close-up of Ann's table. She said that she had considered painting that little pumpkin white, but I'm happy she kept it just the way it is. Ann covered these gorgeous pillows herself. She taught herself how to do the piping and the zipper; we think she's quite a handy seamstress. I am in love with that fabric - so pretty the blues, golds and greens together. Did you notice the orange piping? 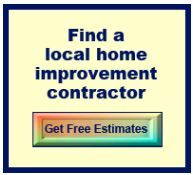 I like the idea of the larger floral print, too, as I bet they look great from the street. 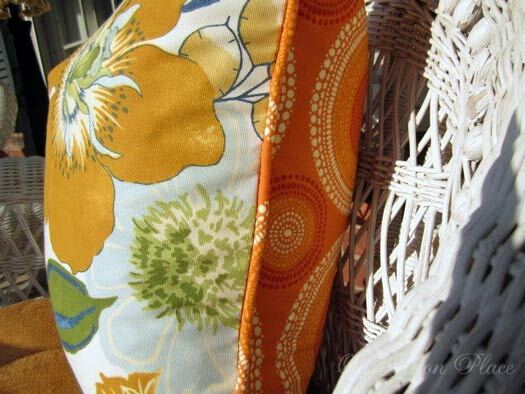 A close-up of the pillows... and I am spying some very fun fabric for the pillow back. Looks like that is what Ann used for the piping, too. Now we get to see Ann's stunning front entrance. 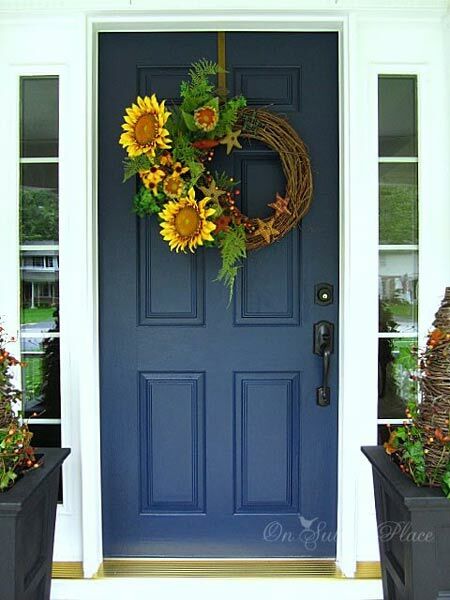 Her front door is a beautiful shade of blue ... I am seeing a theme here. Blues, greens and golds. 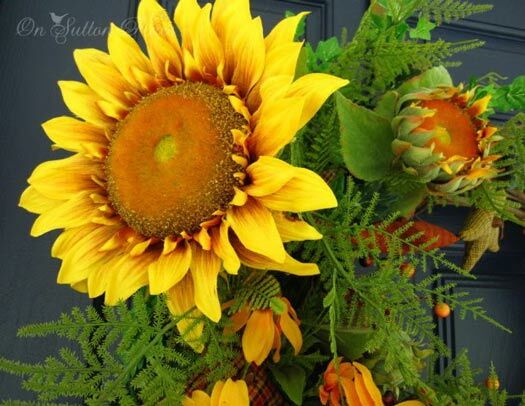 Her decorative front door wreath is accented with bold sunflowers - love that yellow. 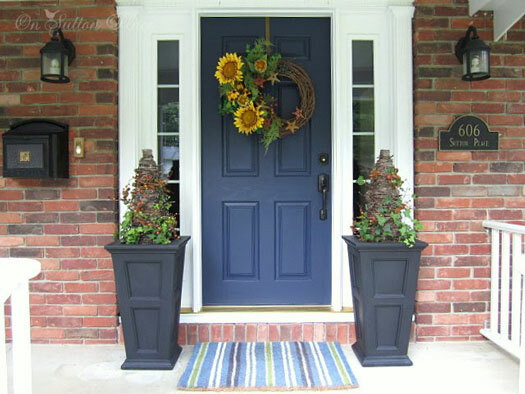 In addition, she has two charming grapevine trees, attractive planters and a blue-striped door mat to pull it all together so nicely. 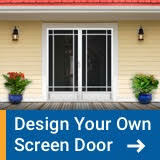 A close-up of her inviting front door. 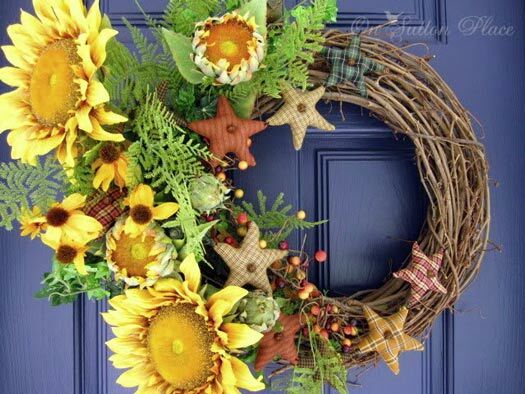 Ann says that she has had this sunflower wreath for several years. Each year she adds something new to it. So this year, she added the berries. Can you guess what she added to her wreath last year? 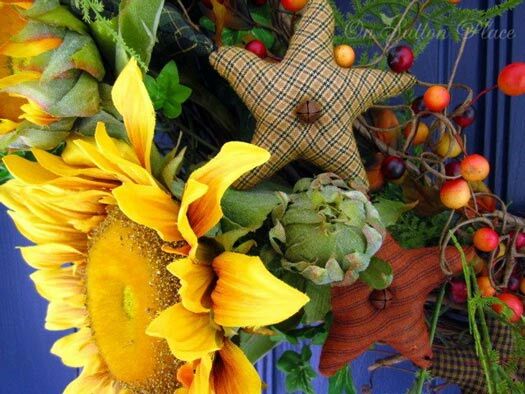 It's that sweet star-shaped garland in homespun plaids. 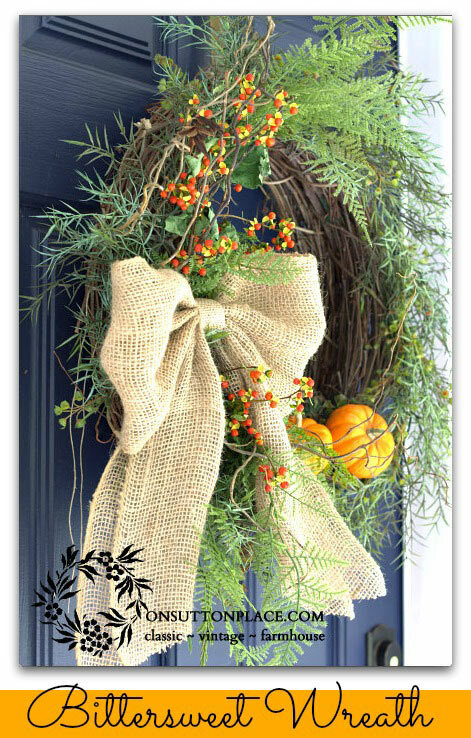 Here is a super close-up that gives you the appreciation for all of the details in her autumn wreath. Oh, look at the little buttons in the middle of each of the stars. I'm glad Ann took these close-up pics. 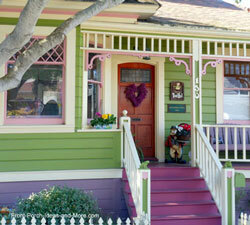 I really like the color of Ann's front door - it complements her home and provides a colorful backdrop for her wreath. Decorating for autumn Ann-style ... it's the best. Stays Green Till Christmas? Wow! 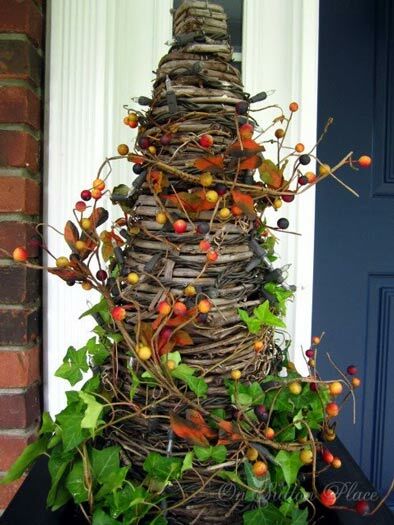 Here is the grapevine tree wrapped in bittersweet and English Ivy. Ann said that she grows ivy in her deck planters. Then as autumn approaches, she "transplants" the ivy to her front porch planters. The ivy eventually circles around the grapevine trees on its own and stays green even through Christmas (providing Ann gives it drinks of water!). If you look very closely, you can see that she has a string of lights wrapped around her tree, too. 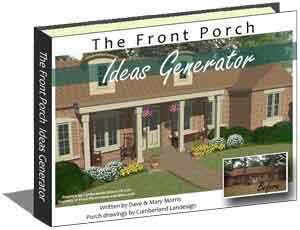 Wouldn't it be fun to see a picture of her porch at night with her trees all lit? When Dave and I visited Ohio this summer, I noticed other homes having the grapevine trees, too. Seems like they could be decorated for any season. Ann said she searched all over for an autumn-themed fabric that had blues and greens in it. She really did not want to have to put her door mat away and we think she more than succeeded. Even her mailbox and porch lights are very classy. 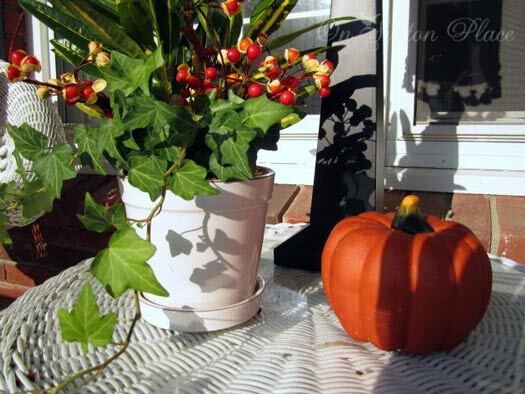 We sure like Ann's autumn decorating ideas. Decorating for autumn is a refreshing change from summer. Don't you think? Decorating for autumn with Ann! We like her style. Thanks, Ann. Ann is a real true DIY gal - and she's been DIY'ing it for quite some time. She enjoys taking pictures and writing about her DIY adventures on her blog. She is honored to be inspiring others and sharing her ideas with people who want to do the same. 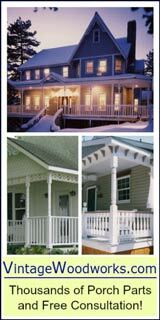 Please visit Ann's wonderful, classy blog, On Sutton Place, to see more of her colorful and creative ideas - both inside and outside her home. 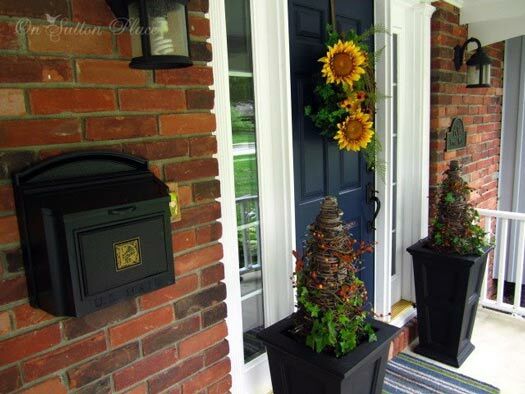 Our warm thank you to Ann for sharing the pictures of her front porch decorating for autumn. 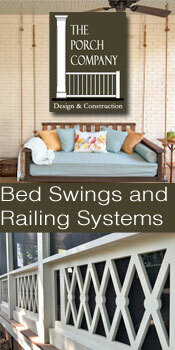 We would enjoy seeing yours, too. 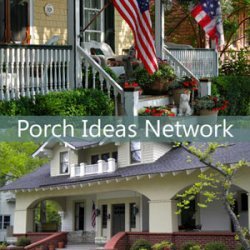 You are most welcome to share your porch decorating ideas with us.